The CCRB accused officer Daniel Pantaleo of recklessly using a chokehold to cause physical injury to Garner. The NYPD officer accused of using an unauthorized and fatal chokehold on Eric Garner in 2014 will undergo a departmental trial on the allegations in May, nearly five years after the Staten Island altercation, the department's deputy commissioner for trials ruled Thursday. Deputy Commissioner Rosemarie Maldonado brushed aside a request by attorneys for Officer Daniel Pantaleo to delay the administrative case until the U.S. Department of Justice decides whether to file federal charges against him. The Justice Department has been investigating Pantaleo for a possible criminal civil rights charge. According to the officer's defense attorney Stuart London, officials in Washington have to decide if they are going to press federal charges before the five-year statute of limitations runs out July 17th. London had wanted Maldonado to wait until that date passed before going to trial. Maldonado said the administrative trial, which is being prosecuted by attorneys for the Civilian Complaint Review Board, will start May 13 and is expected to last about 10 days. If found guilty, Pantaleo could face dismissal. He is now on modified duty on Staten Island. London argued that the two counts filed against Pantaleo in connection with Garner's July 17, 2014, death — recklessly and intentionally causing fatal injury — are legally inconsistent. “Is it a recklessness theory or intentional theory? I need to know,” London told Maldonado. He said more than 40,000 pages of documents related to the case were turned over to him and he intends to bring in his own medical expert to testify. Garner died after Pantaleo and other officers wrestled him to the ground as they attempted to take him into custody for illegally selling loose cigarettes on the street. Pantaleo put Garner in a chokehold that then-Police Commissioner William Bratton later said was not authorized under NYPD regulations. Cellphone video of the altercation soon went viral, with a dying Garner gasping, "I can't breathe," and helped spark a national debate on use of force by police officers. A Staten Island grand jury declined to indict Pantaleo in December 2014 and thousands of demonstrators took to the Manhattan streets in the days afterward to protest the decision. Maldonado, alluding to the intense public interest in the case, as well as the need for the Garner family and Pantaleo to have closure, said she didn’t want to delay the trial much longer. An autopsy showed that Garner, well over six feet tall, weighing nearly 350 pounds and suffering from asthma and heart disease, died as a result of compression of his neck and chest during the physical restraint by cops. Garner’s asthma and heart ailment were listed as contributing to his death. London said he intended to call as an expert witness Dr. G. Wesley Clark. According to the Patrolmen’s Benevolent Association, Clark has previously said Garner didn’t die from police brutality but an “unfortunate synergy” involving his obesity that officers couldn’t have anticipated. 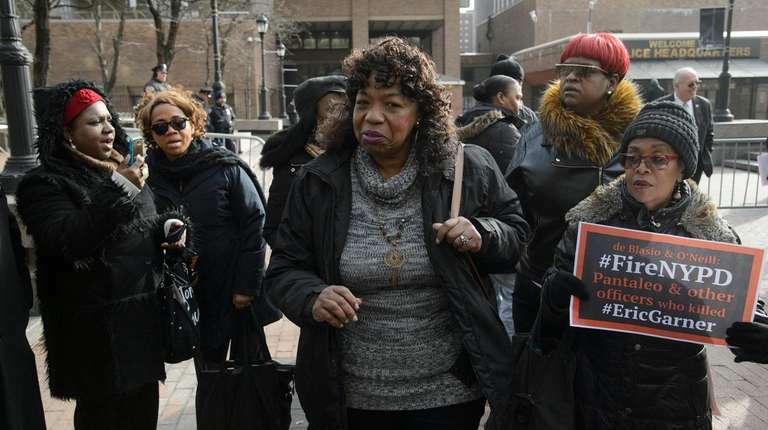 During a news conference Thursday outside NYPD headquarters in Manhattan, Garner’s mother, Gwen Carr, said she was glad that after four years the trial would start. “We would have liked to see it much earlier but I am just glad this is moving forward,” said Carr, who wants Pantaleo fired. PBA president Patrick Lynch said at a separate news conference that Pantaleo’s attorney would show that the officer did exactly what he was trained to do.